1943 – Bud worked M.T. & Dad Day lights I cleaned house Ruth & her folks came ovefr To Grover city She & Bud Dug clams. 1945 –Today was a terrible Day Dutch Took me To B. Shop at 9.30 Came Back & got his hair cut & & The cop picked him for D.D. & He didn’t get out Till 11 Tonight. 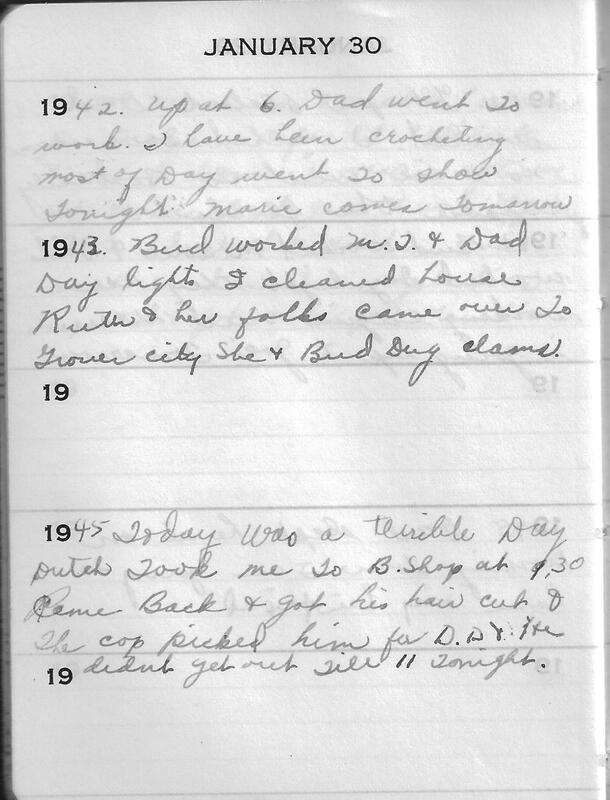 The mention of Grover Beach in 1943 entry is the first time she’s talked about it in this diary. They would go on to build three houses there in 1950. The 1945 entry was sad. I’m sure the D.D. in the entry is Driving Drunk.